where as the rest of us view the world at 20/20. He is a Delightful little man, I enjoy spending my days with him! and ~ some areas of schooling are challenging for us both..
the sky is the limit when it comes to projects! Projects can be created to suit his vision with little to no challenges! unlike math, reading and well… sports! ugh! It all started with a map. 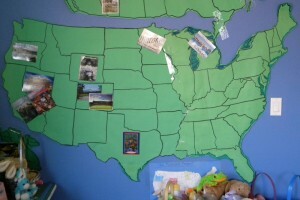 collecting postcards from family, friends, connections from all over the USA! b/c I like to complicate things a little! another story for another day! * ahem* oops that sounded wrong!! 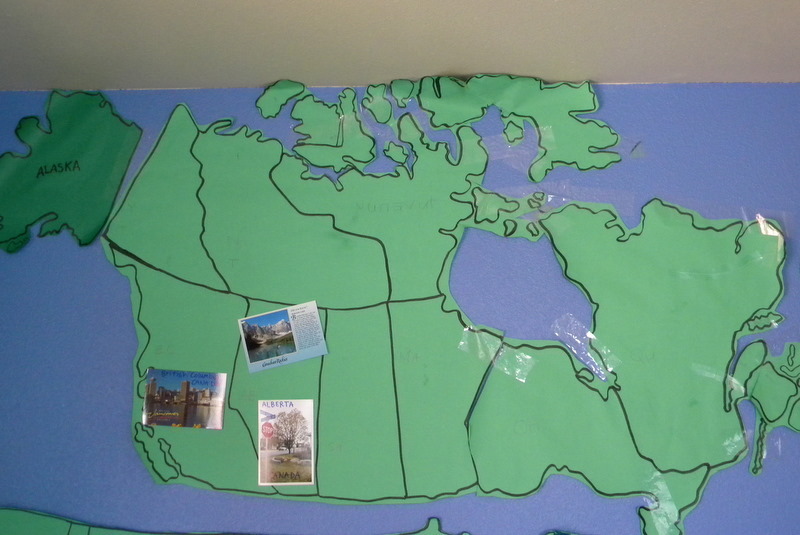 um… I enlarged Canada today!! We would love love your help with this project!! and we have had some great postcards come in! But not nearly as many as we had hoped!! sniff! we are very shy of our goal! We would love to collect All 50 states, All Provinces and one from each continent! 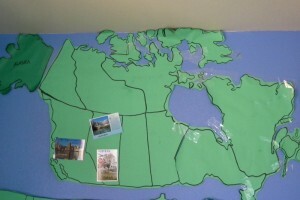 Making a giant map was my spin on the project! I figured it would be exciting to fill the map!! that our friends or family have written about on the back of each one! Thank you Derek, Amy and Auntie Margaret and Uncle Peter!! Thank you grandma & grandpa and the Morris Family!! 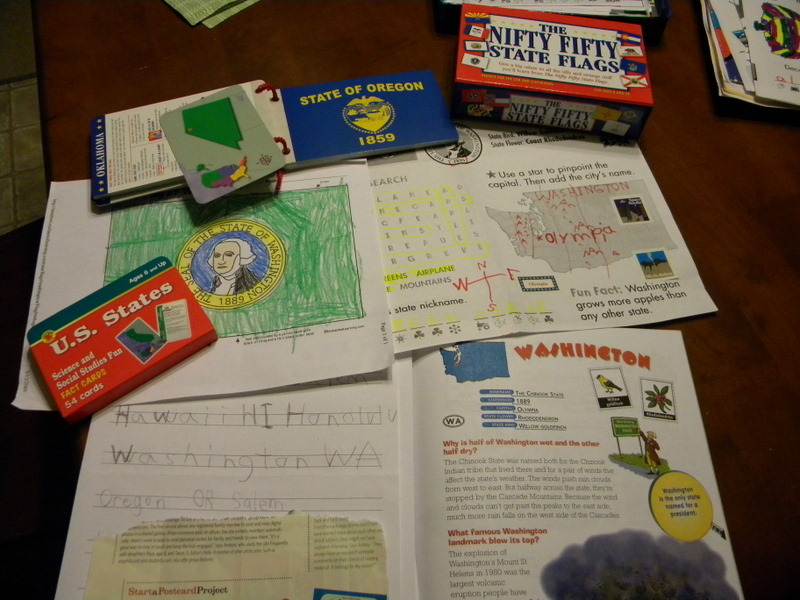 Washington not pictured… ahem… we live in Wa!! ha ha! I did finally put it up after this picture! Thank you Jer, The Berbells, Aunt Linda, Jon & Barb, Jane and The Messings! SO ~ How can you help?! Thanks for asking!! Help our postman fill our map??!! I have been known to BRIBE when I really really want something done! remember I have like 300 of these? 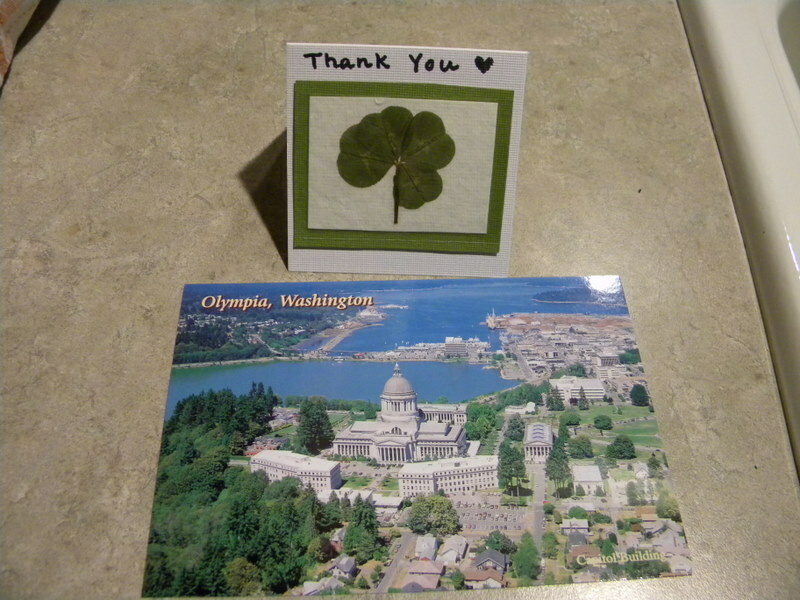 to each person who sends my babies a State postcard! only one of each state though ~ we will have to play a game! 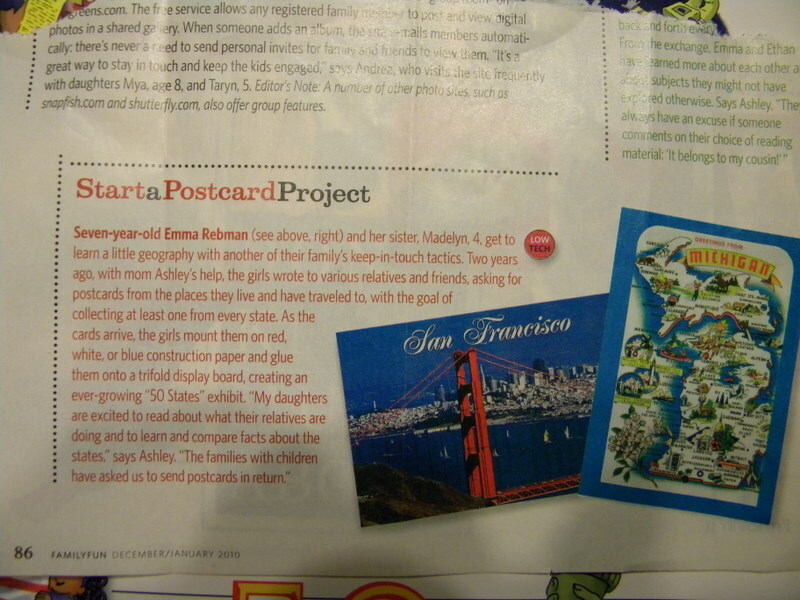 We would love love to have the Name of your State on the front of the Postcard! First willing soul to comment from each state wins the clover! I will connect with the winner via email to seal the deal! with a 4 leaf clover attached to it!! or just a clover! your choice!! Please consider helping Mr. Mailman bring us a Postcard from your State! I am sorry to those of you whose states we already have!! 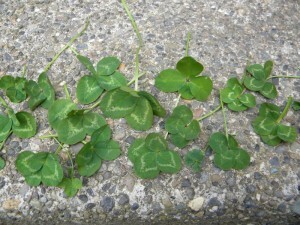 I will come up with other clever ways for ya all to win lucky 4 leaf clover from our crop! or just be with me! one more sleep until my giveaway! 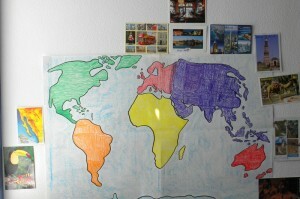 OH ~ I will also do a weekly shout outs with my updated map!! We’d be happy to send you a postcard from Ontario, Canada. Would love to send you one from Oklahoma! Just e-mail me where and who to address it to! Count us in for Sunny Florida! 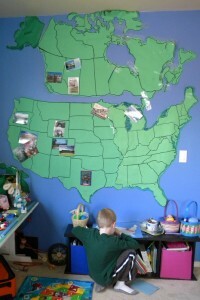 We;re actually doing something similar for my nephew who lives in Georgia. He is in 3rd grade and his class sent out “Flat Stanley”— have you seen the book? So cute! Well I’m in Montana and would love to send you a postcard from here! Just email me your address! 🙂 What a great idea, too, by the way! My parents are in Arizona (I think) right now…next time I talk to them, I will have them pick up cards along the way home from each state…did you have London? I think I can get one from there the next time my sis goes. Too bad I didn’t know this before my inlaws went to Italy! They are there right now…oh well! Oh my gosh, this is such a cute idea. I see you already have California so I can’t be in the running. Let me know if someone does not claim Oklahoma and I might be able to get my sister to send you one. Ok…sign me up for IA and IL…I will get back to you with a few others I might have, but I can guarantee those first two. Just shoot me your address. Since you already have one from California, I know how much fun this process can be. Here is hoping that God will bless you in getting all the postcards and enjoy learning more and more about the different places they all come from. By the way love your four leaf clovers. Where did you get them? This is such a fun idea. We can send more from England if you like. Kids love collecting things like that. My daughter started collecting the state quarters when we last visited the US. Well, doggone it. You’ve gone and covered Michigan already! Love this idea…I’m a new follower…found you via PW! I can send one from Ohio! Still need one of those? And I can get you one from Indiana when we visit Lake Michigan (yes, in Indiana) in June…if you still need one, that is! And we might venture over to Chicago, so I could get you one in Illinois if you still need it then. and we may get over to Michigan, too. 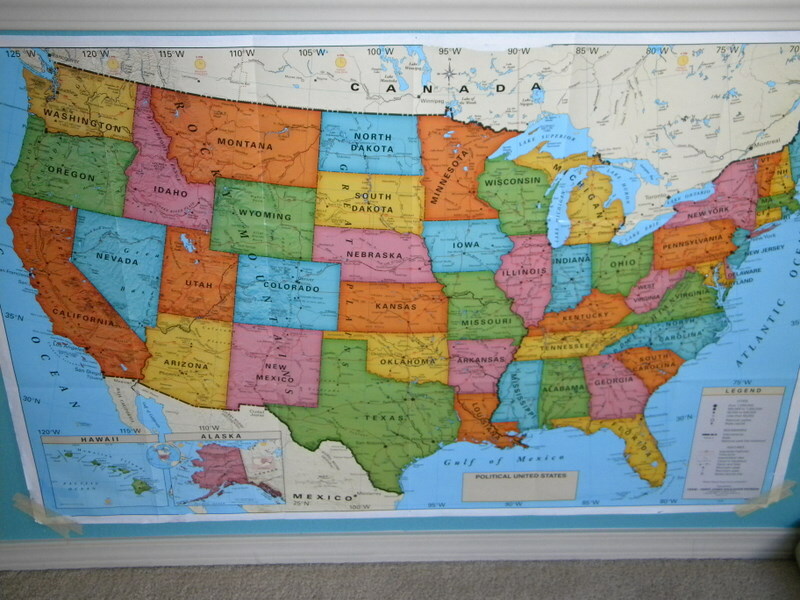 I’ll keep an eye open to see where you are at in June and if you are still needing any of those great states on your ginormous map! I can send one from Kentucky! Horse capital of the world!